The 6 Best Speakeasies in Iowa! If you’re looking for a tucked-away space to enjoy an Old Fashioned with your friends, a speakeasy is what you’re looking for. With 1920s, Prohibition era inspiration, the speakeasies of Iowa exude “cool.” Enjoy live jazz and a secretive atmosphere at these six speakeasies in the state. From the front, the Cellar 626 sits inconspicuously as the state-famous Cyclone Liquors, your one-stop shop for craft beer, fine wine and great supplies before an Iowa State home game. In the back of the facility however, the real fun is to be had at the Cellar 626 speakeasy. Elegantly set and stocked with a more-than-full bar, the Cellar 626 can provide a classy time grabbing a drink on the down-low. Refurbishing the inside of a 1920s brick and mortar building in Clinton Street in Iowa City allowed Clinton Street Social Club, Iowa City’s premiere gastropub and speakeasy, to be born. Featuring hand-crafted cocktails, local brews and an award-winning food menu, Clinton Street Social Club doesn’t require a nice outfit to enjoy, but you might feel out of place without one. Also home to regular jazz performances, Clinton Street Social Club can give you a great flavor of the prohibition era. Focusing on providing an underground element to the Des Moines nightlife, Black Sheep isn’t afraid to break some night club conventions, and it uses a little bit of the Devil’s Drink to help along the way (tequila). With an emphasis on various outlets of art, including inspiration from 1920s and 1930s speakeasies, Black Sheep might not be on your immediate radar even if you have lived in Des Moines for a while, and that’s perhaps just the way it’s supposed to be. While the name might be a dead giveaway, the Chicago Speakeasy of Des Moines delivers on a family-fun experience with a heavy Prohibition theme and high attention to detail. Featuring full lunch and dinner menus, prime rib, seafood, pasta, chicken, ribs, chops and sandwiches, the Chicago Speakeasy also delivers on a full bar featuring over 50 signature cocktails. 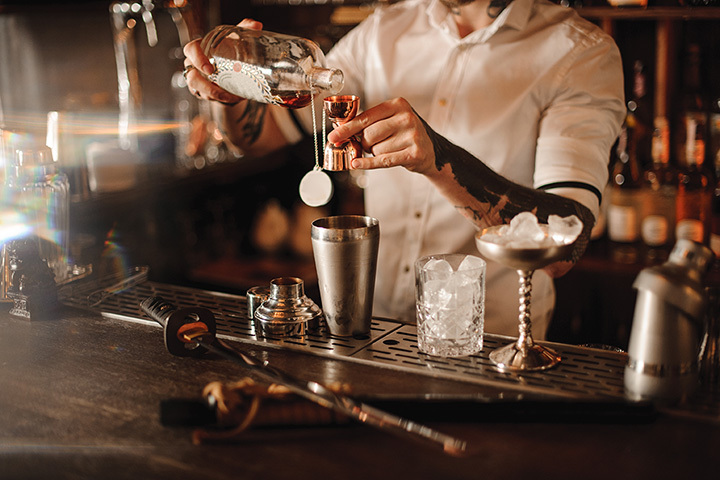 Whether you go for the wide variety of drinks, the delicious food or just the ambient atmosphere, you’ll be sure to enjoy your time at the Chicago Speakeasy. Connected to the state-famous Vino’s Ristorante in Cedar Rapids, and surrounded by shelves of colorfully bound books, the R.G. Books Lounge gives the real feel of Prohibition era alcohol serving. Whether you lay low near the bookshelf sipping an Old Fashioned, or you meet some friends to choose from the lengthy wine selection, this classy lounge is best kept a secret once you visit yourself. With a striking speakeasy ambiance, Barleys Bar in Council Bluffs provides a retro interior to get you in the mood of prohibition-era dining and drinking. Featuring a full menu of all your favorite pubs fares, Barley’s isn’t just a place to order a drink and get some food, it’s a comfortable gathering space to enjoy the company of family, friends and strangers. No need to be secretive about Barley’s, and this celebratory gastropub is the perfect place to party and unwind from the day. View more Iowa Bars and Saloons.